**For hundreds of ways to bookmark our site, check this out. What is our sample thank you letter uses highlighting?The thank you letter is a great supplemental document that provides you a crucial opportunity to highlight your qualifications after the interview to an employer. 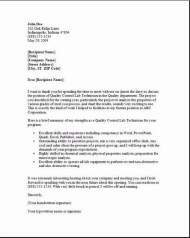 The letter also assures the employer of your fitness for the position, by letting you bring up any misconceptions during your past interview. Thank them for the interview and provide reasons why you are the candidate for the position. Highlight only specific qualifications you have targeted for this position. Show your motivation as to why this position is a great match for you. Your thank you letter should not exceed more than one page. Highlighting is explained as bringing up your skills and accomplishments that are of special interest to that employer that were talked about during your interview. Now is the time to instill confidence to the person who interview you,by recapping that you meet every detail in their job description. Not only will this thank you letter show your courtesy, it will also highlight your professionalism. Thank you so very much for our meeting discussing your executive assistant position. I really enjoyed myself, and also just get plain excited every time I think about the opportunity to join your team. I am very confident our conversation of my success of running an office in the past has helped to showcase my skilled abilities. I would like to highlight my skills once again, such as taking care of bookkeeping, great at customer service, also claims processing, and I am very proficient at all types of report preparation. Your mention of very strong people skills for this position. My previous supervisor whom I have as a reference, says Jims friendly and very professional customer service abilities helped my firm to achieve a 10 % revenue increase just last year alone, without him I just don't see how it would have been possible. Again, I want to thank you in considering me as this is a very exciting opportunity. Citing our conversation during the interview, I’m also enclosing my professional references. Feel free if you would need any additional information to call me. I am looking forward to hearing from you. 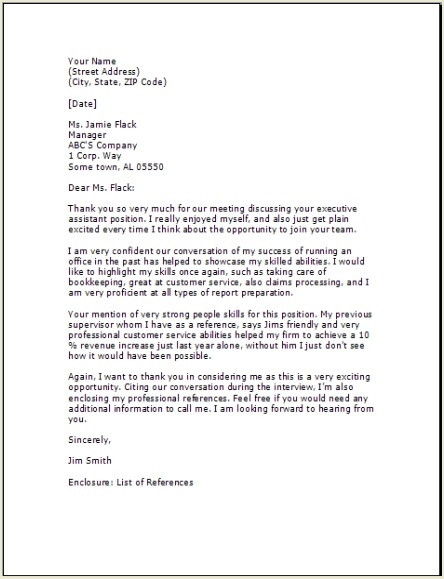 Did you know that most people do not send a post interview thank you letter highlighting their interview? You will always double your chances of getting the position as the thank you letter also shows your new employer you are really interested. When is the last time you got a thank you from someone? How did it make you feel? The interviewer will feel the same way! !